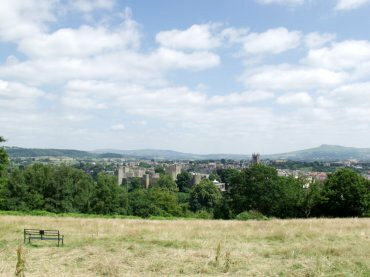 Ludlow was described by John Betjeman as "the loveliest town in England" and I am inclined to agree with him. 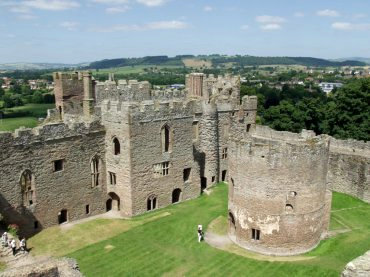 For the discerning tourist Ludlow seems to have everything - narrow medieval streets, ancient buildings seemingly everywhere, an impressive and picturesque castle, a delightful river with quaint bridges, a cathedral-like parish church and the surrounding countryside is breathtaking. The hill on the right of the horizon is Titterstone Clee Hill. View across Ludford Bridge, Ludlow. 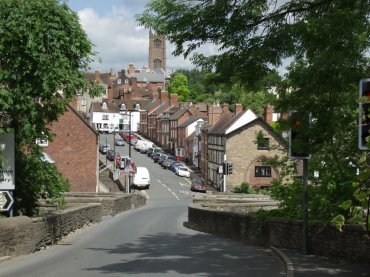 This view of Lower Broad Street is from the southern edge of the town looking across the narrow Ludford Bridge. Lower Broad Street goes up to Broadgate, one of the original gates into the town, and thence into Broad Street with its delightful Georgian buildings. The very impressive tower of the parish church stands like a beacon above the town. I haven't seen a tower as broad as this on any other parish church. This hotel, built in 1619, is probably one of the most photographed buildings in Shropshire and you can easily understand why. Have you ever seen such an extraordinarily decorative building? The hotel consists of the decorated centre section and the upper storeys each side. 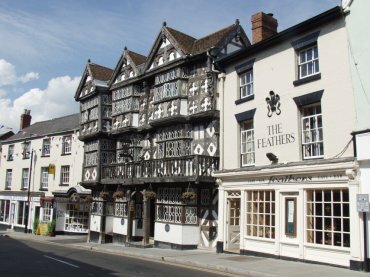 We stayed at The Feathers for the duration of our visit to Ludlow in July, 2005. This is the North Range and the Round Chapel seen from the top of the Great Tower or Gatehouse Keep. The date at which building was started is unknown and, although it is first referred to in the 12th century the architecture suggests that some parts of the building date from the 11th century. Although it is now a ruin it is a very large building with lots of interesting places to explore and this is one of the best castles that we have visited.